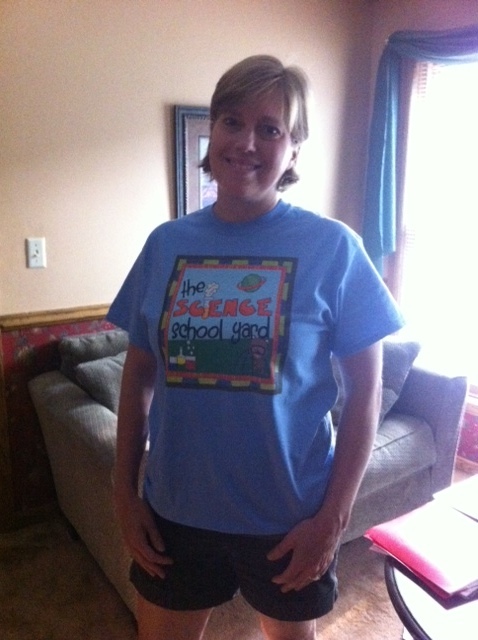 A+ Images: Free Blogger T-shirts for Teachers! Have you heard of TeacherShirts.com by A+ Images? A few weeks ago I heard about how I could get a custom teacher blogger shirt for FREE! I love freebies, and signed up for a blogger meet up in October...what a perfect way to share who I am...and my little blog in the middle of Wisconsin. I took advantage of their limited time offer and uploaded my logo on their easy to use online design tool. Within minutes I had created my own custom blog t-shirt! They had tons of t-shirt colors to choose from, and I love how perfect the color turned out! The material and quality of their t-shirts are excellent! I washed my t-shirt and it still looks great...no fading or shrinking! A+ Images is a family owned business located in Indianapolis, IN. I love the fact that they are family owned, and anyone purchasing their products are helping support a family rather than a large corporation. My husband is a PE teacher and coach and routinely needs t-shirts for school. I can't wait to find a way to give back to a great business that sees what we do as valuable! You can purchase their ready made designs or create and upload your own. They can even add "bling" to your shirt using rhinestones, or if you prefer they can do custom embroidery. They are super easy and friendly to work with, and they ship fast! While on their website, I noticed so many awesome teacher t-shirts! I'll definitely buy from this company in the future.